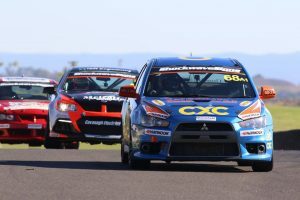 An extremely busy month of Production Car racing reached its conclusion at Sydney Motorsport Park over the weekend, with the running of the second round of the 2017 Shockwave Signs Production Touring Car Championship. 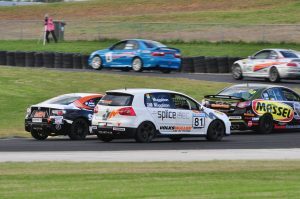 Jacques Oosthuizen cleaned up in the opening round at Wakefield Park in Goulburn, but now attention was firmly on Sydney Motorsport Park, where the series was lining up for a crack at the 4.5km Brabham Circuit for the first time in nearly five years. It’s a sprint round, which means three championship races. Daniel Smith is the outright series leader coming into Round 2 – the last sprint round before we get the MoComm Cup underway for 2017. 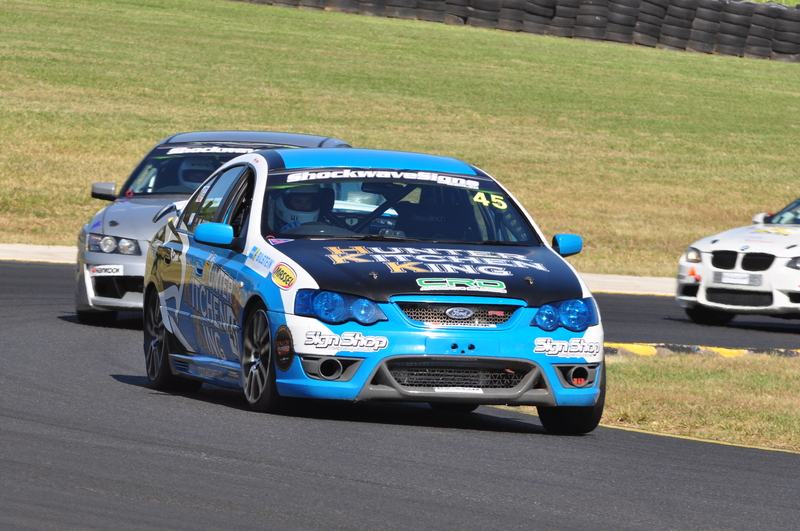 Smith’s debut at Wakefield Park had heads spinning, as he won everything there was to win in Class D, much to our surprise, given the form Jimmy Vernon carried into 2017. 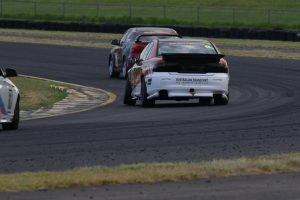 Smith is back with a new livery on his Honda Integra, while Vernon returns to the grid after an extraordinary debut in the Toyota 86 Racing Series at Phillip Island, where he won two of the three races. 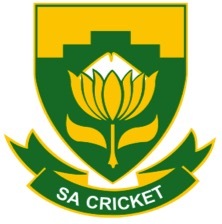 For the second round in succession, 34 entries were received for the two-day event. Daniel Oosthuizen was a welcome return to the paddock, as was Dylan Thomas, as CXC Global Racing fielded three entries for the round. 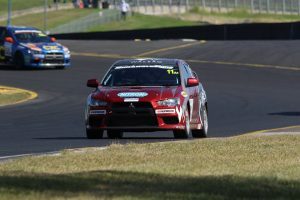 Oosthuizen missed the opening round recovering from off-season shoulder surgery, while Thomas was back, simply to have a run on the full circuit, something he hadn’t yet done in his Mitsubishi Evo X. With Thomas now competing in the Toyota 86 Racing Series, this round would be his last in the Shockwave Signs Championship, before putting the car on the market. 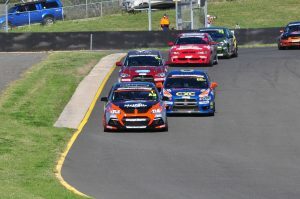 Only six classes were represented at Wakefield Park, but here in Sydney, we had the full compliment, with the return of James Herrington in his Class S Commodore, while Scott Turner was making his series debut in Class C.
Friday practice was uneventful for most of the paddock, but unfortunately there was drama at CXC Global Racing. Daniel Oosthuizen’s engine suffered a crack in the block, which saw the CXC Global Team put in an all night effort, to build an engine out of spare parts at their workshop, to try and get Daniel back on the grid for Qualifying. 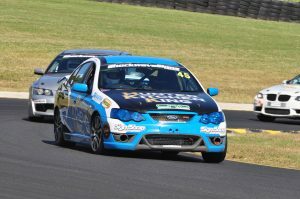 Their efforts were successful, as the weary-eyed crew returned to Sydney Motorsport on Saturday morning with the car ready to go. Unfortunately, due to the nature of the problem, Daniel was forced to run his replacement engine in during the 15-minute qualifying session, which prevented him from setting a competitive time. For the rest of the field, Qualifying was business as usual, and to the surprise of nobody, it was a CXC Global Racing Mitsubishi Evo on top at the end of the session, as Dylan Thomas secured his, and Mitsubishi’s, first pole of the season. As good as Jacques Oosthuizen was at Wakefield Park, he was beaten to pole by the Roadchill Express BMW of Barry Graham. 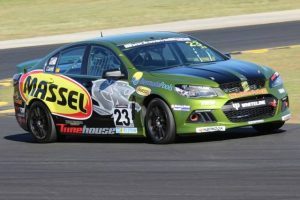 On his way to Pole Position, Thomas secured the qualifying record for this configuration of the Sydney Motorsport Park Circuit, with a 2:07.8259. 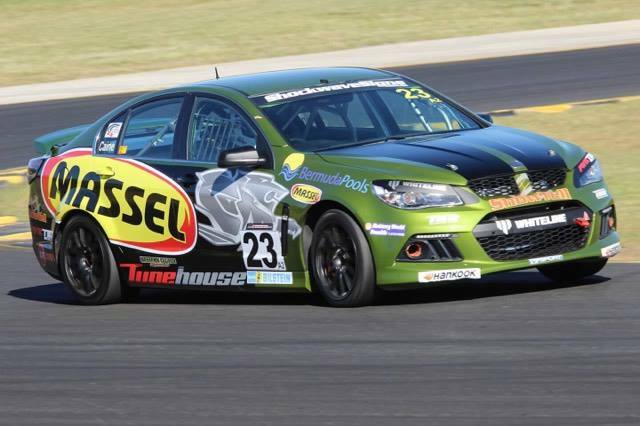 Matthew Holt put Holden on the front row with a 2:08.9468 – taking Class A2 honours along the way. Trevor Symonds, Mark Caine and Paul Loiacono rounded out the top five. As for the remaining classes, Scott Muller continued his dominance in Class B1 so far in 2017, as did Daniel Smith in Class D – respectively, they were 10th and 12th outright, and just behind them was Jonthan Fishburn, who was the best of Class B2. 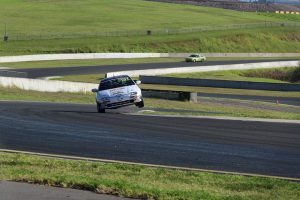 Scott Turner was the best of Class C, while Finley Hills was the best of Class E, and James Herrington topped Class S. The three drivers were 29th, 30th and 32nd respectively, in the three classes that fielded just one entry for this round of the series. 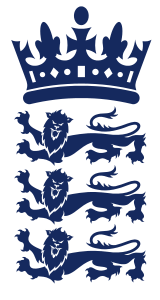 The first race would be contested over 25 minutes. Jacques Oosthuizen was forced to start from the rear of the grid, due to a fuel issue that occurred while his he was in parc ferme, getting ready to take to the circuit. That left two CXC Mitsubishi’s at the rear of the field. 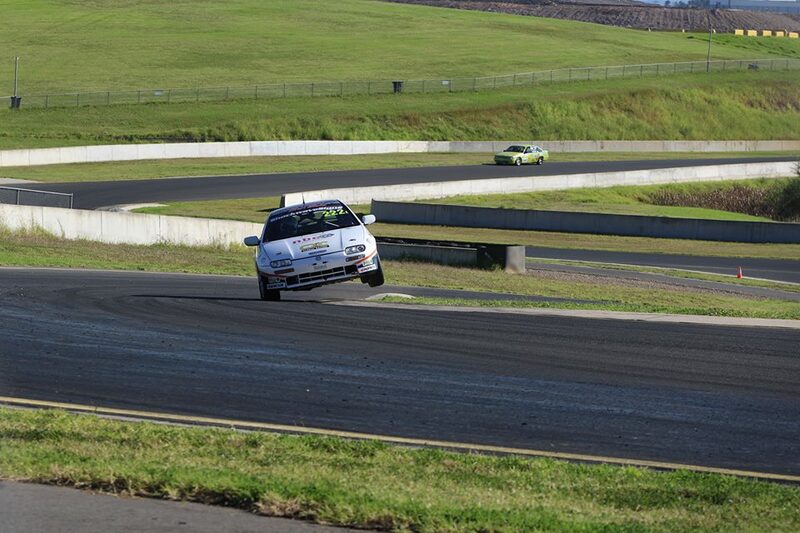 but off the line, the one at the front, Dylan Thomas jumped well, and took the lead going into the first corner. Sadly, his run at the front was short-lived. On lap 2, he was forced into retirement as a result of a loose diff – just continuing the weekend of mechanical dramas for CXC Global Racing. 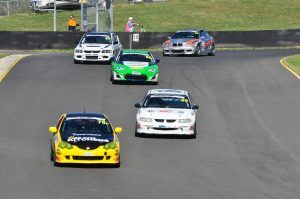 With Thomas eliminated from proceedings, the battle for 2nd became the battle for the lead, and intensified quickly, as Mark Caine, Barry Graham and Paul Loiacono latched on to the back of Symonds and Holt, who inherited the lead. Holt would lead until Lap 5. At that time, Mark Caine made his move. 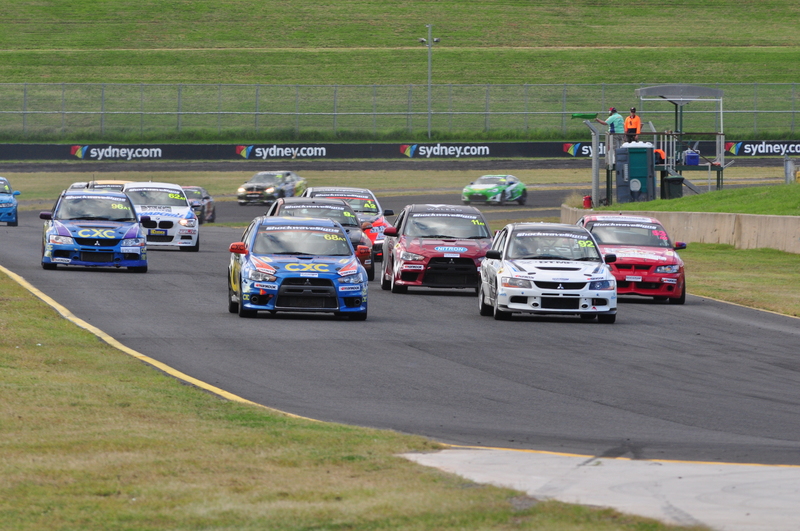 He grabbed second from Trevor Symonds on lap 4, and then took the lead at turn 15 on lap 5, relegating Holt to second. Paul Loiacono followed Caine through, and then went to the lead himself on Lap 6, but that was short-lived, as the straight line speed of Caine’s Clubsport proved too good for Loiacono’s Evo, and he reclaimed the lead on Lap 7. Barry Graham took fourth off Trevor Symonds on Lap 8, and then there was no change to the running order in the run to the chequered flag, leaving Mark Caine to claim his third win in NSW Production Touring, ahead of Loiacono, Holt, Graham and Symonds. It was a real fight for sixth position between Rodney Thorpe and Stephen Thompson. 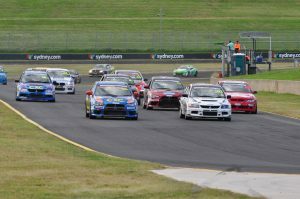 Thorpe was the winner of Class A2 in the opening round, but only managed seventh in the opening race of the weekend in Sydney, as Thompson displaced him on the final lap, metres from the chequered flag. 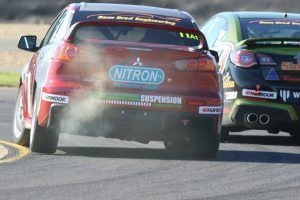 Mark Caine’s outright win also gave him the win in Class A2. Paul Loiacono grabbed his first class win for that new Class A1 Mitsubishi Evo of his. Elsewhere, Tom Muller won Class B1, Daniel Smith was victorious in Class D, Jonathan Fishburn won Class B2, Scott Turner claimed Class C and James Herrington was first home in Class S.
Unfortunately, Finley Hills failed to claim championship points, after finishing the race one lap early. There was no problem with his car, but a misunderstanding led him to believe he had already taken the chequered flag. 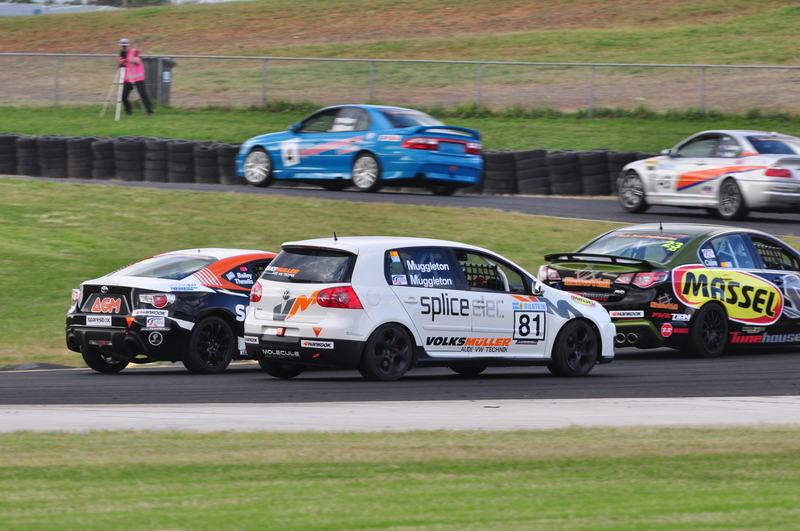 Jacques Oosthuizen finished 8th, but was given a 5 second post-race penalty that saw him relegated to ninth. With Caine’s victory came the end of Mitsubishi’s dominance on New South Wales soil. The Japanese manufacturer won every race held in NSW during the 2016 season. 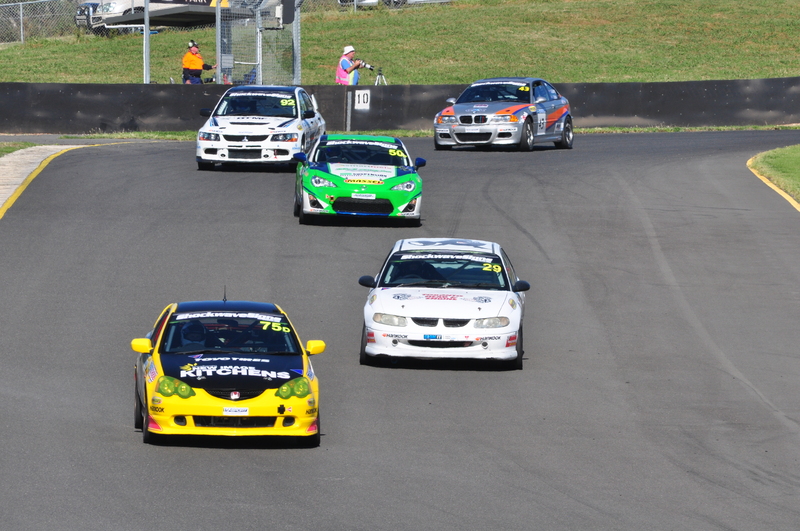 You have to go back to October 2015 to find a win from a different manufacturer – in that instance, BMW through Barry Graham – and back to September 2015 to find the last race win by Holden in NSW – that was Tony Virag at SMP during the MoComm Cup round, and before that, it was Daniel Flanagan at Mount Panorama over the Easter weekend earlier in that same season. To have the top three separated by just 3.0698 seconds was off the chart – one of the closest green flag races we’ve ever seen in this series, and one that had everyone on the edge of their seat for the duration. Mark Caine was the winner of a thriller in Sydney, that has left us hanging out for more of the same. Two races still to come. 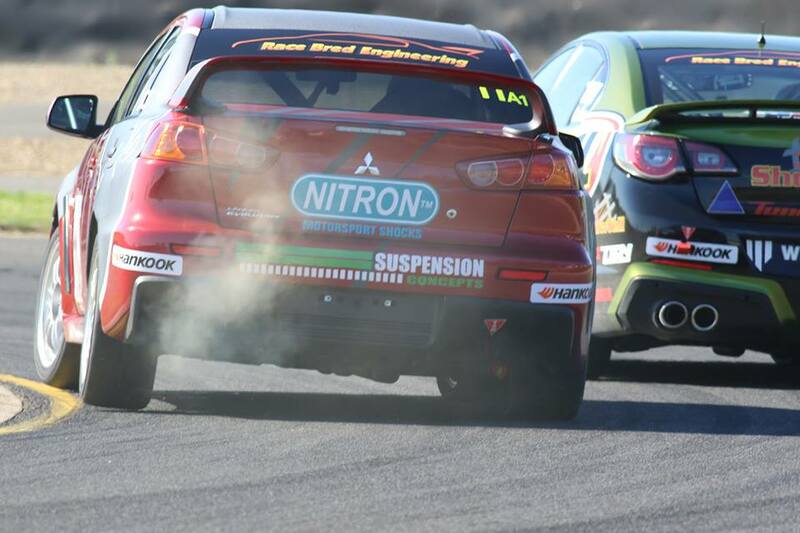 Can Mitsubishi bounce back, or will Holden take the momentum and run with it? 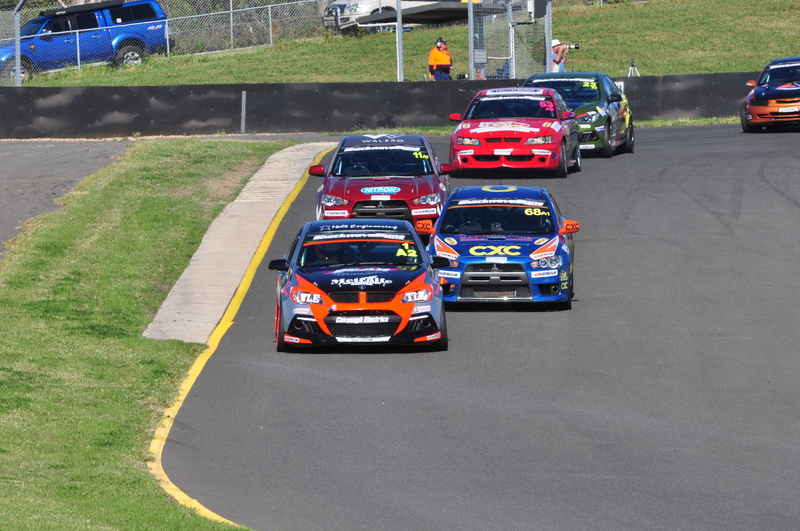 We’ll find out, as Round 2 of the 2017 Shockwave Signs NSW Production Touring Car Championship continues. Smith’s Unbeaten Run Ended, as Heath Wins in Sydney.